The 2016 Travelers Championship PGA golf tournament is taking place this week from August 4-7, 2016, at the TPC at River Highlands private golf club located in Cromwell, Connecticut. Here is a list of the betting odds for the PGA golfers to win the 2016 Travelers Championship. All golfers with odds of 60 to 1 or less are listed with comments. Then a number of notable golfers with much higher odds are also listed with comments explaining why. Good luck to all the PGA golfers and especially the bettors this week at the 2016 Travelers Championship! At relatively large odds of 12 to 1, Bubba Watson is the betting favorite this week to win the 2016 Travelers Championship. Bubba Watson has not been in the top 10 in a PGA event since early March and he just tied for 60th at the PGA Championship. 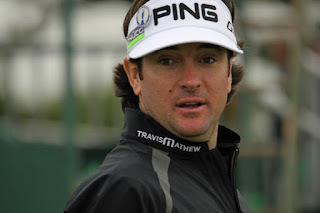 But Bubba Watson is the defending champion in this event and he did win the 2016 Northern Trust Open in February. Brooks Koepka just finished a very good 4th at the 2016 PGA Championship. Koepka is battling a foot injury but if he plays this week like he did last week he's a big threat here. But Brooks Koepka has not won on tour since February of 2015 in Phoenix and that win was his first and only win on the PGA Tour to date. Branden Grace also tied for 4th place at the PGA Championship last week. Grace won the RBC Heritage in April for his only win on the PGA Tour. He does have seven more wins on the European Tour including a win this year in the Qatar Masters. The 28 year old from South Africa could certainly win this week. Patrick Reed tied for 13th place last week in the PGA Championship after he tied for 12th place at the British Open in his previous start. So he's playing pretty good but he's not won a tournament now in over 19 months. He can certainly win this week but is 20 to 1 odds high enough for a bet? Matt Kuchar missed the cut last week in the last major of the year and he's a tough bet this week. Kuchar is 38 years old and he has seven wins on the PGa Tour but he's not won a tournament in almost 2 1/2 years now. Zach Johnson tied for 33rd last week in the PGa Championship. Zach has not won on tour in over a year now as his last win was at the 2015 British Open. He does have 12 wins on the PGA Tour, though, which makes him a better bet this week than a player like Matt Kuchar is. Jon Rahm did not qualify for the PGA Championship but the tour rookie was 2nd at the RBC Canadian Open in his last start two weeks ago. This is a good spot for him to try to get his first PGA win but it's tough betting a maiden on the PGA Tour. Paul Casey tied for 10th last week in the PGA Championship after he missed the cut in the British Open in his previous start. The 39 year old Englishmen has just one PGA Tour win (2009) but he does have 13 wins on the European Tour. Casey has not won anywhere since 2014 but this is a good spot for him to win if he plays like he did last week. J.B. Holmes missed the cut last week after he was 3rd at the British Open in his previous start. Hard to judge this week. Jim Furyk finished tied for 73rd last week and he's only won one tournament on the PGA Tour since 2010. Louis Oosthuizen tied for 22nd last week. He's got as much ability as anybody in this field but his lone PGA Tour win remains the 2010 British Open. Daniel Berger is interesting this week. He only tied for 73rd place last week but he did win the St. Jude Classic in June and he could play well here. Webb Simpson tied for 13th at the PGA Championship last week. So he's playing well but his last win anywhere was in 2013. Marc Leishman is a great golfer but he's only one once in 195 PGA Tour starts but his one win was in this tournament in 2012. Francesco Molinari has yet to win on the PGA Tour in 83 starts and he only has three European Tour wins and his last win was in 2012. Gary Woodland missed the cut last week and he's not won since 2013 on tour. Russell Knox won for the first time on tour last November. He's played OK lately and this is a good spot for him to try for win #2. Brendan Steele missed the cut in his last two starts and he only has one win on tour which came in 2011. Charley Hoffman missed the cut last week. He did win earlier this year on tour but has not played well enough to win lately. Padraig Harrington tied for 13th in the PGA Championship but he's only won one tournament since 2008. Daniel Summerhays finished alone in 3rd place at the PGA Championship last week but he's still looking for his first PGA Tour win at age 32. Brian Harman is 29 and only has one win on tour which came in 2014. Justin Thomas is the kind of player you might want to take a risk on this week at 55 to 1 odds. He's only 23 as he seeks his 2nd win on tour. Kevin Chappell is 30 years old and has yet to win on tour. Ryan Moore is 33 years old and he has four wins on the PGA Tour but his last win was in 2014. Tony Finau missed the cut at the PGA Championship last week. He won the Puerto Rico Open in late March for his first PGA Tour win at age 26. Kevin Streelman won the Travelers Championship in 2014. That was the last of his two wins on the PGA Tour. Streelman is 37 years old. Freddie Jacobson won the Travelers in 2011. That remains the 41 year old's lone win on the PGA Tour. He has three more European Tour wins. Ken Duke won the Travelers Championship in 2013. That remains Ken Duke's only win on the PGA Tour and he's 47 years old. Hunter Mahan won the Travelers Championship in 2007. Mahan has six PGA Tour wins and he's married to a Dallas Cowboys cheerleader but he hasn't won since 2014 and he's missed the cut in his last five starts and in eight of his last 10 PGA Tournaments.